Saturday saw the second of the English Fell Championship series, a long race in the Howgill Fells, starting at Sedbergh. 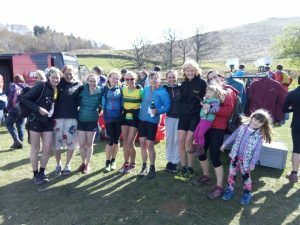 There was a good turnout of Keswick men and women in what proved to be potentially one of the most gruelling races of the season. It was 13.5 miles with nearly 7,000ft of climb. With six different climbs, the race consisted of multiple steep up and down sections, with hardly any running in it at all. It turned out to be a beautiful spring day, even rather warm, so navigation was not an issue, and the Howgill fells, what Alfred Wainwright described as sleeping elephants, were shown off in all their magnificence and glory. Keswick AC’s Carl Bell took the win, with Helm Hill’s Rob Jebb in second place, separated by only 21 seconds. Mark Lamb was 3rd, and with Dan Mills 10th and James Appleton 13th they all put in fine performances to take the team prize. In the ladies, the race was won by Vic Wilkinson, who was over 5 minutes ahead of Nichola Jackson and Sharon Taylor. Keswick’s Hannah Horsburgh was 6th lady, Jenn Mattinson 14th and Zoe Webber 35th, followed by Rachel Findlay Robinson. In the team standings, Keswick ladies were 3rd team. Another 15 men ran, with some great performances, particularly by Keswick men’s veterans, including Dave Birch, James Haworth, Dave Prosser, Craig Smith, Andrew Slattery and Steve Angus. At the New Dungeon Ghyll Fell race, Keswick’s young Harry Greenbank beat off the local competition to take the race win. 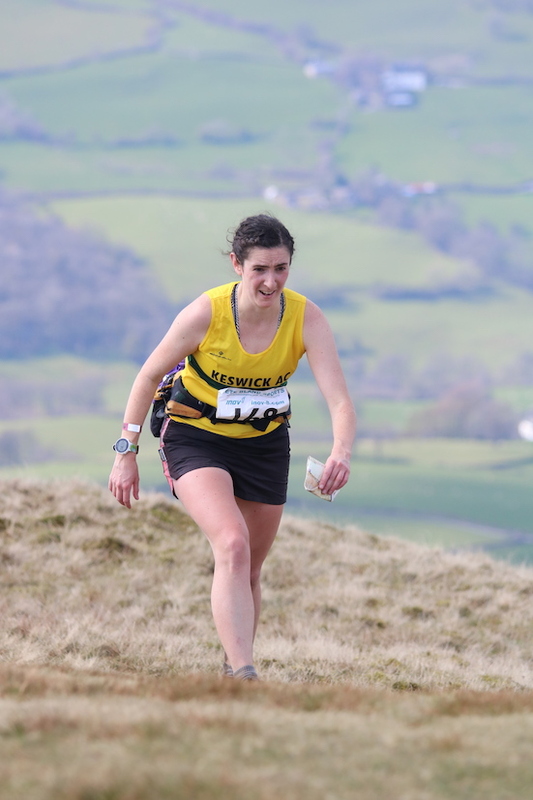 Keswick AC’s Claire Warner got a PB of 1:21:05 at the 3 village 10 (Liverpool to New Brighton) race on Sunday. Lindsay Walker was the second lady at the High Terrain Events Kielder 32k trail race and came in 3:07 and Siobhan Brewer was 3rd lady. Many of KAC’s runners chose to support the Coledale Horseshoe race at Braithwaite, preferring the atmosphere and familiarity of our local fells. This is always a popular race and this year was no exception with warm spring sunshine encouraging over three hundred runners to the start line. It has all the best features of a Lakeland fell race: meet in a field, pay a few pounds, run to the point of exhaustion, have lots of tea, cake and sandwiches, come back with a tale to tell, and, if you are lucky, a prize! Keswick did do well on the prizes front too! Brennan Townsend was the second runner home but being behind Ricky Lightfoot is no disgrace! Cat Spurden was also second in the ladies race. Philippa Wakefield won the V40 ladies race, Julie Carter came second V50 and Lesley Malarkey, in her first race as a V70, won the V60 prize. Keswick men also won the team prize. Picture: Keswick ladies at the Coledale Horseshoe, credit: Louise Brown.